Babe Ruth League, Inc. is proud to announce its new teammate – Alleson Athletic, the first Official Uniform Supplier of Babe Ruth League. For the 2018 season, Babe Ruth League will be providing customized Alleson Athletic uniforms for select Cal Ripken Baseball, Babe Ruth Baseball and Babe Ruth Softball World Series participating teams. This partnership allows Babe Ruth League to become the only youth organization that provides fully-customized, sublimated uniforms at the World Series level. Each participant will wear their name and their number. Alleson Athletic has been rooted in youth athletics since the company was founded, supplying high quality team uniforms and sports apparel to teams and athletes for 85 years. Alleson Athletic is committed to giving every athlete a chance to participate in sports in order to reach their goals on and off the field. 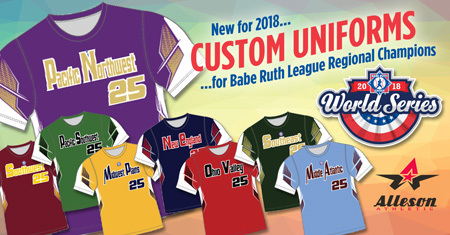 Whether local league teams want stock, decorated or fully sublimated garments, Alleson Athletic and Babe Ruth League are making it easy for them to create their own custom uniforms. In the very near future, a uniform builder website will be available that will allow teams to design a high quality, customized uniform. They will be able to choose from a multitude of styles, colors and fabrics and customize with team names, logo, player numbers and names. And for convenience, the official Cal Ripken Baseball, Babe Ruth Baseball or Babe Ruth Softball emblem will be included as part of the jersey. For further information, contact Babe Ruth League Vice President Joseph Smiegocki toll-free at 1-800-880-3142 or via email at joe@baberuthleague.org. Alleson Athletic was founded in 1933, and today is the largest manufacturer of in-stock uniforms and the preeminent manufacturer of custom sublimated team uniforms in North America. With two factories and three distribution centers, we are able to service the world with top-quality game uniforms and practice wear. Since our founding, Alleson Athletic has been supplying quality products with the value, performance, and service that our dealers and athletes have grown to expect from us. Babe Ruth League, Inc. was established in 1951 and is a non-profit educational organization providing organized baseball/softball activities for boys & girls, 4-18 years of age. 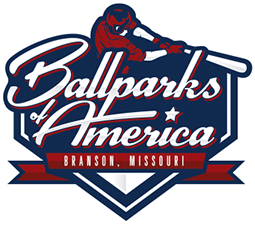 Babe Ruth League has over 1 million participating in Babe Ruth Baseball, Babe Ruth Softball, Cal Ripken Baseball (A Division of Babe Ruth League, Inc.) and Bambino Buddy Ball, throughout the United States and Canada.